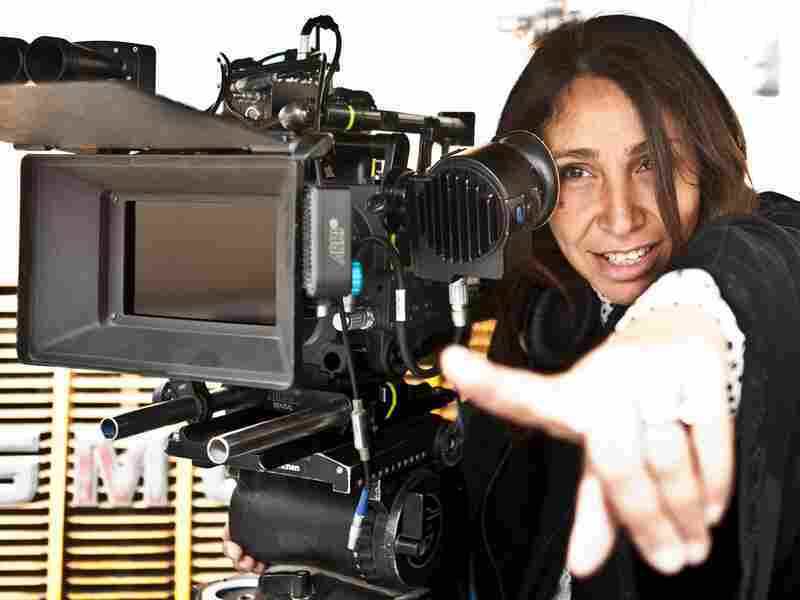 Saudi's First Female Film Director Says Women Aren't Victims Film director Haifaa Al Mansour comes from a small town in Saudi Arabia where, she says, there are many girls who have big dreams, strong characters and infinite potential. She's made a movie about one of them, titled Wadjda. Host Michel Martin speaks to Al Mansour about the film and being a female movie director in Saudi Arabia. "I wasn't trying to make a 'loud' film," Saudi Arabia's first female film director tells NPR's Michel Martin. Haifaa Al Mansour's Wadjda is the first full-length feature film to be shot and produced in Saudi Arabia, and it lifts the veil on life in the kingdom. Wadjda tells the very universal story of a spunky 10-year-old girl by that name, and her wish for bicycle. "I am making a film in Saudi Arabia — and that is controversial enough," Al Mansour says, noting that she didn't want to make big statements about the culture clashes. "I don't want people to feel offended back home." And if Al Mansour did not intend for her film to be loud in impact, neither were her movements in making it: "It was really difficult to shoot in Saudi," she says. "I'm really proud that I was able to shoot the film entirely in Riyadh. "The country is segregated and men and women are not supposed to mix together. I had to film from a van, and I had a walkie-talkie, and a monitor, and I was always confined in that space." Saudi Arabia is also not as closed as it once was, Al Mansour notes. "There is some room for women, and room for arts, and I felt, it's such a rewarding feeling to be able to bring film into Saudi," she says. I grew up watching a lot of films, and they had so much power, emotional power on me as a kid. In a small town, there is nothing to see, nothing to experience sometimes. And I witnessed life unfolding through film. And when I grew older, and I came back to work in Saudi in early 2000s, I wanted to assert myself in the workplace and everything, and it was hard for me. As a woman, I felt invisible, and it was a low point, so I wanted to make a film just as a therapy. I based her a lot on one of my nieces, who has a great sense of humor, who's a hustler and she's always scheming to earn money somewhere. But my brother became conservative, and she changed. And a lot of the girls I went to school with — and I went to public school — are like that. When they were kids, they had so much to offer to the world, but because the world is very — their families and the small society around them — is very limiting, they gave up so much. And I wanted to make a film that tells them that they shouldn't — that they should be true to themselves and continue, and embrace their potential. And those girls can change the world if they are given the chance and if they believe in themselves. She came in late in the auditioning process, around seven weeks before principal shooting, and it was really great when we saw her. She just came, she didn't care. She's wearing her jeans, and she had this spirit, and then we wanted her to sing. And, of course, she sang Justin Bieber ... and she knew the whole song, so I thought she speaks English. I tried to introduce her to the film producers, they're German, and she didn't speak a word of English. It's only what she knew, Justin Bieber songs. And for me that was amazing. It's like, this is how Saudi is, they have access to pop culture, but still they're very traditional. I don't want to see women as victims anymore. I feel like it is very important to give them characters that inspire them and give them self-confidence to continue. And for me, also men, I don't want to portray men as the evil, and the oppressors, because it is not real. I think both men and women are trapped in a very conservative society, that sometimes they make decisions that are not based on individual choices, as much as how to be part of the tribe or part of the collective. It is not black and white, the situation, and the film does not neglect where it comes from in terms of women's rights and all that, but it also concentrates on how women are survivors.